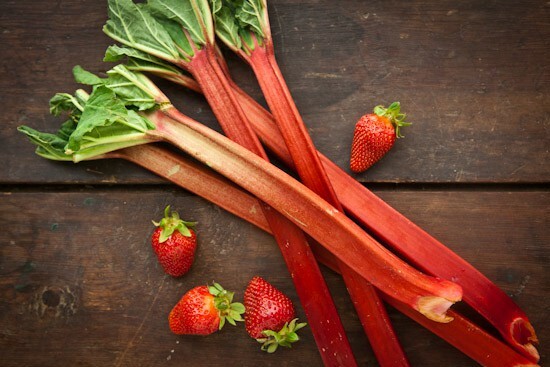 It’s Spring Fling time again and this week we’re talking about rhubarb. You may remember that I came to know rhubarb for the first time only a couple of years ago, but it’s been a love affair ever since. I love its tart, astringent nature and while most people won’t eat it until it’s been cooked and sweetened, I love to pop a few pieces in my mouth while chopping it up for compote, or pie, or delicious Rhubarb Blueberry Turnovers. To celebrate rhubarb this week, I decided to combine it with some of our extra-sweet local strawberries and a bit of local honey to make a compote. I then layered the delicious compote with extra sliced berries and lightly sweetened whipped cream to make a wonderful new-to-me dessert called a fool. I don’t know why it’s called a fool (although I’m sure Wikipedia does), but move over Strawberry Shortcake, this Strawberry Rhubarb Fool is now my favorite spring dessert! So what is rhubarb, exactly? Botanically, it’s a vegetable, but it was classified as a fruit by a U.S. Customs Court in 1947. In the United States, it’s widely used in desserts, so I guess the fruit classification kind of makes sense here. According to The Food Encyclopedia, rhubarb is often used in savory dishes in parts of Europe and the Middle East. I’d love to see some savory rhubarb recipes if any of you care to share! The leaves of the rhubarb plant can be toxic, so if you grow it at home, be sure to use only the stalks in cooking. As you can see from the photo above, some grocery-store rhubarb comes with parts of the leaves attached, so trim the stalks before chopping the rhubarb for this recipe. 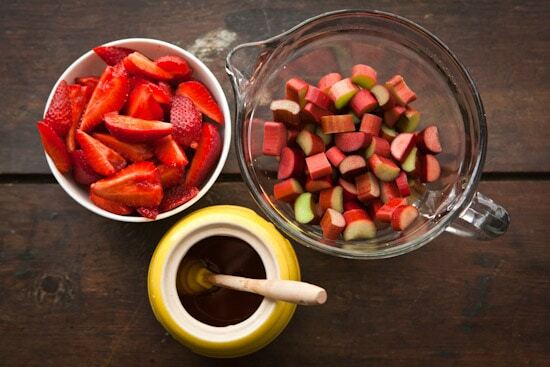 Making the Strawberry-Rhubarb Compote is simple and only takes three ingredients: rhubarb, strawberries, and just enough honey to sweeten. Combine it all in a saucepan with a bit of water and simmer until the fruit breaks down and the mixture thickens a bit. Once it’s thickened, let it cool, then refrigerate until it’s completely chilled. You can then use this compote for anything! I love it spooned over Greek yogurt and I bet it would be a great addition to Strawberry Shortcake. My favorite way to use the compote is in this simple, delicious, and beautiful Strawberry Rhubarb Fool. If you prefer, the compote can be gently stirred into the whipped cream rather than layered. It’s delicious and beautiful either way – the choice is yours. 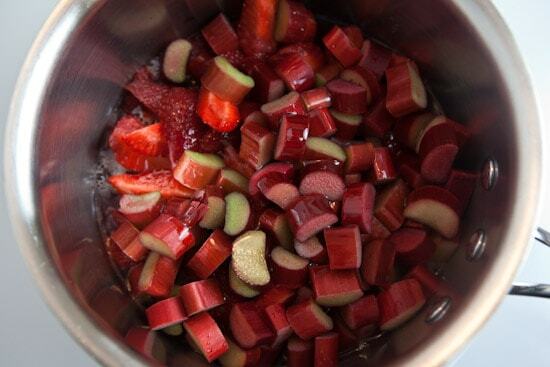 Combine rhubarb, half the strawberries (reserve the other half for layering in the dessert), honey, and water in a medium saucepan. Bring to a simmer over medium heat then reduce heat to medium-low and simmer, stirring occasionally, for 15 to 20 minutes until most of the rhubarb has broken down and the mixture has thickened a bit. Remove from heat and let cool then place in a covered container and refrigerate for a couple hours or until completely chilled. Whip cream, vanilla, and a bit of stevia or powdered sugar (to taste) until soft peaks form. 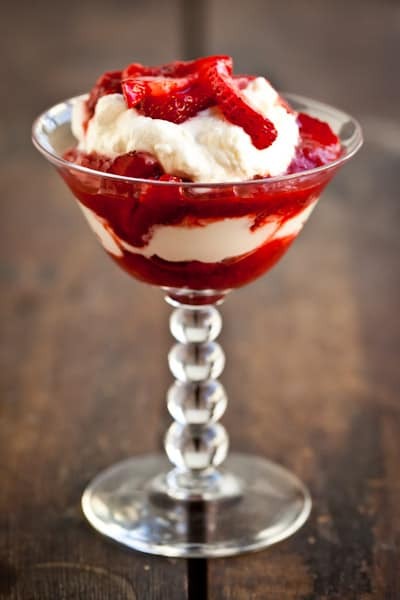 Layer compote, sliced strawberries, and whipped cream in clear glass dishes, dessert glasses, or wine glasses. Enjoy! Have a tip or recipe to share about rhubarb, or one of the other spring farm- or garden-to-table crops on our Spring Fling lineup? Leave your tip or recipe in a comment on this post, and copy it onto the comments on all the participating blogs (listed below) so that the maximum number of people enjoy your idea. Links back to your own blog, or sites you love, are encouraged (older posts are fine). The more the better! Nicole, this looks beautiful! As a child, I ate stalks of rhubarb raw, dipped in sugar. Today I make a crumble with strawberries, and quinoa flakes. I love the sweet-tart combo. Here's the recipe: http://glutenfreegoddess.blogspot.com/2011/04/gluten-free-strawberry-rhubarb-crumble.html Happy Spring! I do love rhubarb and combined with strawberries it makes the most delicious dessert! Growing up in Finland we used to eat rhubarb straight from the garden or mum would make sweet rhubarb soup which is still my favourite! This looks beautiful and oh so delicious! I've never worked with rhubarb before. This dessert looks so pretty and I love the idea of using strawberries too! Karina - Thanks for sharing! Can't wait to head over and check out your crumble! Maria - Sweet Rhubarb Soup sounds wonderful!! I might have to experiment and come up with something similar :-) Nancy - It took me years to finally try it because I didn't grow up eating it. But it's so delicious! I hope you give it a try this season! How did you know I was craving something exactly like this?! I've been wanting to make some sort of strawberry jammy/compotey concoction. Just been craving it for some reason. 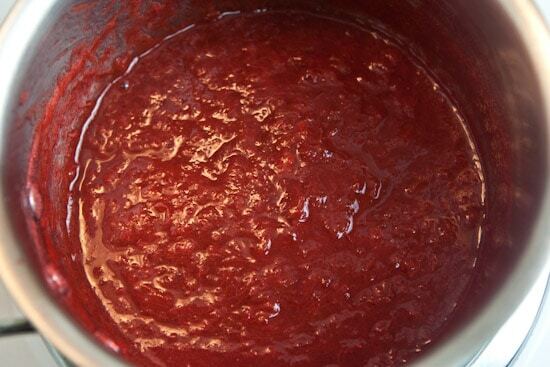 And between the fresh strawberries in my CSA box today and this recipe, it's fate! Also, there's a lemon cake at home and is seriously jonesing for some compote topping. Thanks!I already shared the link on your facebook page (thanks for checking it out! ), but I'll throw my rhubarb hat in the ring with my blueberry rhubarb pie:http://www.bananasforbourbon.blogspot.com/2010/09/blueberry-rhubarb-pie.htmlI'm ashamed to admit I used frozen rhubarb, but better frozen than none! I will be making it again with fresh and I can't wait! This is SO beautiful. Gorgeous photos. :) I love simple, delicious, real desserts. This is definitely on that list. I'll be referencing back to this when our Rhubarb finally comes up at the beginning of June. I am collecting recipes now as I always have more than I know what to do with each year. I keep cutting it back to keep the stalks tender all the way until it freezes up in September, but I am usually Rhubarbed out before this happens. I have a savory rhubarb recipe here: http://csafiles.posterous.com/you-say-bruschetta-i-say-crostini It's a relish that's great on crostini with a little goat cheese. It's not the gorgeous red of your fool (there's unsweetened chocolate in it) but it is quite delicious. Love, love love strawberry rhubarb pie! It's so delicious and easy to make. Nicole, ever since you mentioned strawberry rhubarb fool I couldn't get it out of my head. If only I could figure out a healthy low fat way to make whipped cream. I may try with yogurt but I'm sure it won't be the same as yours! Love the photos! I have never cooked or had rhubarb. I guess from all the comments that I am really missing out. To tell the truth for someone who likes to cook, I have never been a desertsy kind of guy and I have never cooked with rhubarb either. But I gotta say that this dish looks delicious! I will have to take the plunge and try this! I usually make something that looks like this with Greek yogurt and some nice preserves. The funny part is that when I was a kid and causing a lot of trouble at my grandpa's house he would always come into the room and say: "Alright! What's all the rhubarb about?" I guess that is why I have had an aversion to rhubarb recipes. As usual Nicole great post and really nice recipe! Thanks! Very cool. Could not get rhubarb in my neighborhood for two years so I made this Champagne Hibiscus Cocktail that tastes of raspberry and rhubarb for Spring Fling. Hi, Nicole. I love rhubarb and I often use compotes like this to sweeten greek yogurt, as you suggested. The yogurts that are pre-sweetened with fruit are so full of sugar. This is a much healthier alternative and, topped with some homemade granola, so delicious that I can trick myself into thinking I'm having a dessert! I love the rhubarb and strawberry combination. Thanks for sharing. Yummy photos too. If you have extra compote you can make these rhubarb bars: http://www.quincesandthepea.com/sunday-sweets-rhubarb-barsThey're like lemon bars but with rhubarb instead. It was worth spending most of yesterday trying to track down this elusive vegetable. I love sweetening the mixture with honey! Another recipe idea: after making the compote I topped it with a mixture of rolled oats, whole wheat flour, honey and butter and popped it in the oven to crisp the top. So, so tasty! what a simple and tasty looking dessert. love this, Nicole! This sounds wonderful... I am pinning it and will be making it soon. Shared this one my facebook page too. I hope I tagged you right. I have made the rhubarb strawberry compote many times and it was delicious. I have also made a plain cake from scratch and topped it with a rhubarb,brown sugar and cinnamon mixture and serve it with a dollop of whipped cream. I also make a preserve by cutting the rhubarb into 1" pieces and putting it in jars (sealers)along with some orange slices (rind and all) and making a sweet sugar/ water mix 1 cup sugar to 2 cups water, boil and pour over the rhubarb, seal jars and process as you would any fruit canning. This is very delicious and was a cheap desert when the money was tight and we had a large family to feed. We also made a boiled version also with the orange slices and made a jam consistency to be used on toast or very delish on pancakes with sour cream. Give these a try you won't be sorry.